So I am going to cheat since I am so far behind on this blog challenge, and call this a two week catch up. I actually have been working on things related to family history for school, so thought I would share two posts that I wrote on my main blog for my Digital Humanities class. Then on Friday I can post another blog that will catch me up to week 17, as it is a paper I wrote for class on Friday and is on 3 ancestors. 😉 The point of the challenge is to write, right, and that I have been doing–just not sharing!! Post 1: This is the link to part one of my recap of the work I did for the project for my digital humanities class. I used the Shaffer and Zirkle cemeteries in Champaign county, OH and compared families buried there and created visual relationship charts. Then I took information for all the cemeteries in Mad River township, Champaign county, OH and made a map-based database of each. Post one explains hopefully in more detail what I did and links to various posts I made along the way. Post 2: This is the link to part two of my recap and includes the actual visualizations and map I discuss in Part 1. The project culminated in writing an NEH Grant proposal for a larger project involving cemeteries and digital access that I hope to complete for my Master’s thesis. I’m still learning a LOT about digital humanities and I welcome thoughts and comments. Thanks for reading! I am still trying to get my database updated with all the information I can find on the cemeteries in Mad River township, Champaign, Ohio. What I am trying to do is figure out how cemeteries change over time, and with this I want to know how they reflect the change in the town’s own identity. For example, the Shaffer and Zerkle cemeteries included burials until 1883. What happened in 1883? What I suspect happened – and I am not sure yet as I am still gathering that information – is twofold: the family no longer owned the property (yes, according to the deed records the cemeteries were deeded to the Lutheran Church in St. Paris) and the city cemetery, Terre Haute, was built (not sure, I need to go there in person to look at their records). By comparing the number of family burial sites listed in the historic records to the number of family burial sites still in existence today, I can hopefully make some kind of statement about the changes in views on the importance of cemeteries. Findagrave.com fits in here, it’s become such a huge resource for many people interested in finding their family information, yet you really aren’t necessarily always getting the right information. Ownership of the “memorial” becomes a contested area of family vs. other and there is no way to fix this within FAG’s TOS. What does that say about society’s current views on cemeteries? Is photographing our cemeteries a game or a serious attempt at virtual conservation? These are the kinds of questions I am trying to work through in this project. Working on this visualization project I think I’ve stumbled on something interesting. -In my database I have two cemeteries: Zerkle and Shaffer. They are named thusly per Google Maps. 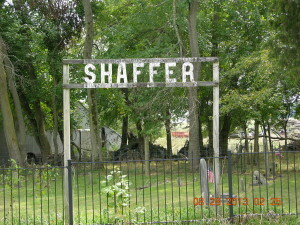 The story behind Shaffer is that a family member placed the sign there because it needed a name. I assume that’s why Google maps gives it that place name. I don’t know why the Zerkle cemetery is given that place name, other than because there are Zerkles (all spellings) buried there. But there are Zerkles (all spellings) also buried in Shaffer. That’s not a surprise, they are all intermarried into each other and the land all around both was once owned by Shaffers and Zerkles. 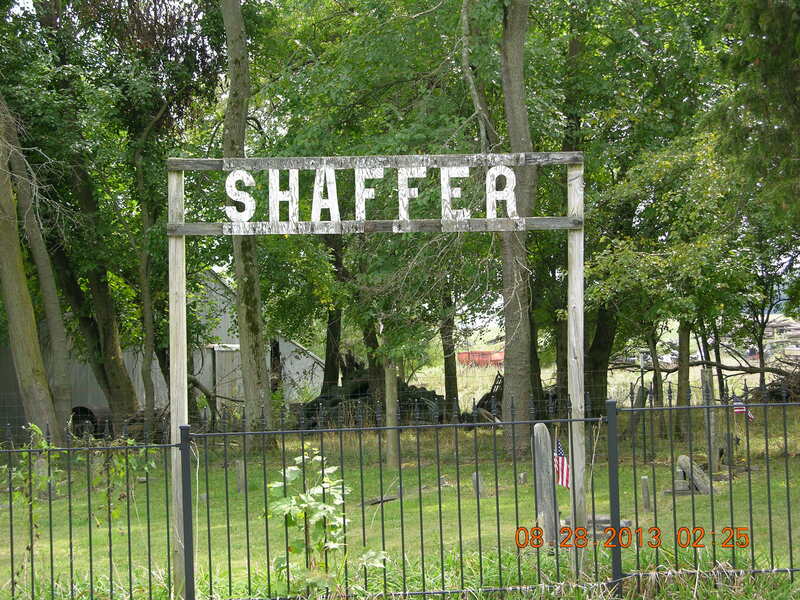 – My spreadsheet that I created shows the earliest burial in Shaffer was 1855, and latest was 1883. Zerkle was 1842 and last 1883. – The current acreage that I was given by a Mad River Township Trustee was over an acre for Shaffer and just over a half acre for Zerkle. – The 1874 map I have showing cemetery markings indicates a cemetery near where the current Google maps lists the Shaffer cemetery. Farther down, near where the current Google maps shows the Zerkle cemetery, is the Zerkle Lutheran church. But NO cemetery marker on the 1874 map. In 1874, the Zerkle Lutheran church was still there so it should be showing on the map. – The deed I have a copy of from 1846 showing Abraham Zerkle deeded 1 acre to the Lutheran Church Trustees for a church and burial ground. – The Shaffer Huston cemetery mentioned in a couple of sources does not exist anymore. The numbers of burials in the various records of Shaffer and Zerkle cemetery vary — much less in the pre-1950 literature available. 1) I think the Shaffer and Zerkle cemeteries are misnamed. Zerkle should be an acre or more. 2) Shaffer-Huston was moved into the “Shaffer” cemetery – hence why there are more burials than originally accounted for. 3) The earliest burial in the “Zerkle” cemetery was Elizabeth Shaffer. Another reason this was probably the family cemetery located on the Shaffer property not the Zerkle property. The Zerkle cemetery, attached to the Zerkle Lutheran Church didn’t exist until 1846-7. Now, how do I show all this visually?! Other than the fun color-coded map I made myself using colored pens. For the first blog of #52Ancestors on my new site, I thought I would try a new idea. Much of my work in school right now centers around the Shaffer cemetery in Terre Haute, Champaign county, OH. Many of my Digital Humanities blog posts will be about this cemetery, I am writing a paper that includes this cemetery, and I am about to embark on a journey to try to get this cemetery restored. So I think for the next 30-31 weeks, I will blog each week about someone buried in the Shaffer cemetery, and how they are related to each other and to me. Solomon Shaffer was the youngest son of Jacob Shaffer and Otillia (Odilla, Otilla) Schmid. Jacob Shaffer was born and raised in Germany, and came to America as a small boy and settled in Berks County, PA. Otillia was his third wife. They were married in PA, and at some point moved to the Shenandoah Valley, Virginia. I’ll blog about them more in depth after I finish the people in the Shaffer cemetery. Solomon (my 4th great grandfather) was born 7 April 1791 in New Market, Shenandoah, Virginia. He was baptized in the Old Pine Church on 29 May, 1791, and his sponsors were Johannes Bord and his wife Catherine. (Source: Wust, Klaus, Old Pine Church Baptisms 1783-1828 p. 20) I don’t know much about his childhood, but I know that the Shaffer, Zirkle, and Roush families lived near each other and I hope to explore that a bit more in depth at some point. Many of the Shaffer, Zirkle, and Roush men served together during the Revolutionary War, and these three families were very tightly interwoven by marriage. In the early part of 1800, some of these family members headed west to Ohio. Abraham Zirkle (another 4th great grandfather, mentioned here) was a pioneer in what would become German, Clark county, Ohio. Solomon married Sarah Zirkle, the daughter of Abraham’s brother George and his wife Catherine Roush. They were married in Shenandoah on 18 September 1816. On the 1820 and 1830 Shenandoah county census they were still living there. According to several sources, at some point in the mid 1800s more of the Shaffer, Zirkle, and Roush families along with friends and neighbors, packed up in their wagons and went to the Ohio wilderness. Most settled right on the border between what is today Clark and Champaign counties. “In 1829 David Miller with a group of Virginia families, John Good, Abram Zerkle and Soloman Shaffer came in a four horse conestoga wagon and all settled near Terre Haute. Soloman Shaffer had 100 acres within a half mile of Terre Haute just southwest of town. Abram Zerkle’s 110 acres adjoined Shaffer on the west. John Good had a quarter section just east of town which later became part of the town. There are two other Zerkles, George and Jacob, who according to deed records owned farms in the immediate neighborhood and at the same time. I am at a loss to tell whether all were brothers or father and sons. Abraham Zerkle sold one-fourth acre in 1847 for a site of the Lutheran church. There is a Zerkle cemetery on the Abram Zerkle farm and a Shaffer cemetery on the Soloman Shaffer land. Another called the Rouze cemetery adjoins the southwest part of town. This land was owned by John, Levi and James Rouze, all of it in section 25 just west of town.” (Source: Ancestry.com) -I take this 1829 date with a grain of salt, the 1830 census still has Solomon and Sarah living in VA; and other sources say these families all moved in 1850. There is a mention of Solomon, Sarah, and several of their children in Evan Middleton’s 1917 publication, History of Champaign County, Ohio, Its People, Industries and Institutions (Indianapolis : B.F. Bowen, 1917), found here on page 500 in his discussion of the Zerkle Lutheran Church. He stated that they left Abraham’s church and formed another church (and from his description it sounds like it was on Solomon’s property) in 1848 in “connection with the joint synod of Ohio.” Among the names he lists are Solomon and Sarah and their children Reuben, Jonathan, Samuel, and Noah and Lydia Zirkle. Because Middleton only lists first names, and many of these families named their children the same thing, I cannot be certain that the Reuben, Jonathan and Samuel are the same as the Reuben, Jonathan, and Samuel that were Solomon and Sarah’s children, but there’s a very strong likelihood that is the case. Why wouldn’t they follow their parents? At any rate, by the time of Middleton’s publication, that church had disbanded and the building was being used as a barn. Abraham Zerkle’s Lutheran church would go on until the 1980s! Anyway, from 1840-1860, the Mad River township, Champaign County, OH censuses showed Solomon and Sarah living there and farming until Solomon passed away on 22 March, 1865. He is buried in the Shaffer cemetery. Sarah followed him in death 4 years later.